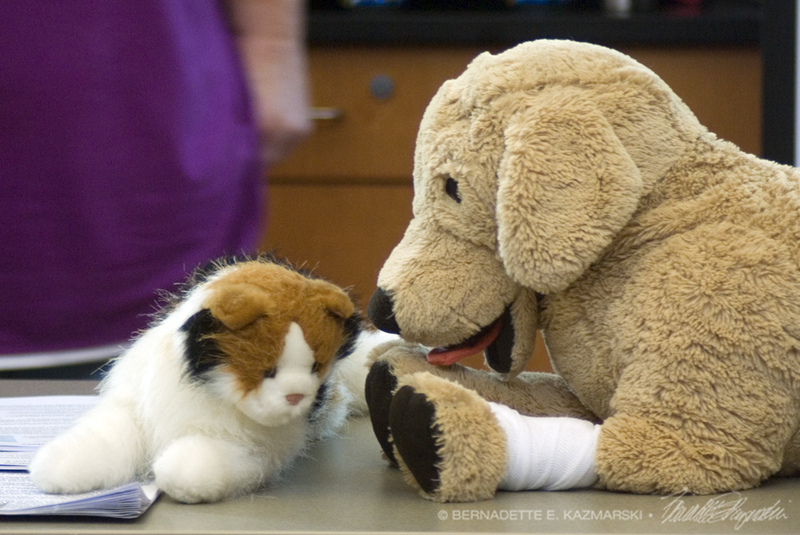 I’m so glad my human learned Pet First Aid! Chartiers Custom Pet Cremation is sponsoring a free Pet First Aid Class scheduled for Saturday, April 29, 2017, Bridgeville Public Library at 505 McMillen Street, Bridgeville, PA 15017. Participants must register before Friday, March 31. Although there is usually a charge for attending these classes, Chartiers Custom Pet Cremation hosts these sessions free of charge to offer families the skills they can use to help save the life of their dear pet. Deb Chebatoris, owner of Chartiers Custom Pet Cremation, partners with Karen Sable, a certified pet CPR and first aid instructor and owner of Pet Emergency Training LLC, to help families learn what to do in the case of a pet life threatening situation. When registering for the class, registrants are asked to choose if they’d like a two-hour informational class or a four-and-one-half-hour class which gives them full certification in providing pet first aid to their pet. So that the registrants can be provided with the class they really want, the majority of registrations will determine the class that is given on April 29. Learning to muzzle a dog for treatment. The four-and-one-half-hour class certifies the student in pet first aid and is designed for people who work with pets such as veterinary technicians, pet sitters and groomers as well as emergency medical technicians who may encounter pets while rescuing people in fires and natural disasters. The course covers injury assessment, rescue breathing, canine and feline CPR, bleeding protocols, choking management, heat and cold injuries, bites and stings, seizures, poisoning, fractures and limb injuries, and the creation of a home pet first aid kit. Participants will receive lecture presentations as well as extensive demonstration on stuffed animals and hands on skills practice. The class includes training materials, a first aid handbook, Certificate of Completion and wallet card. 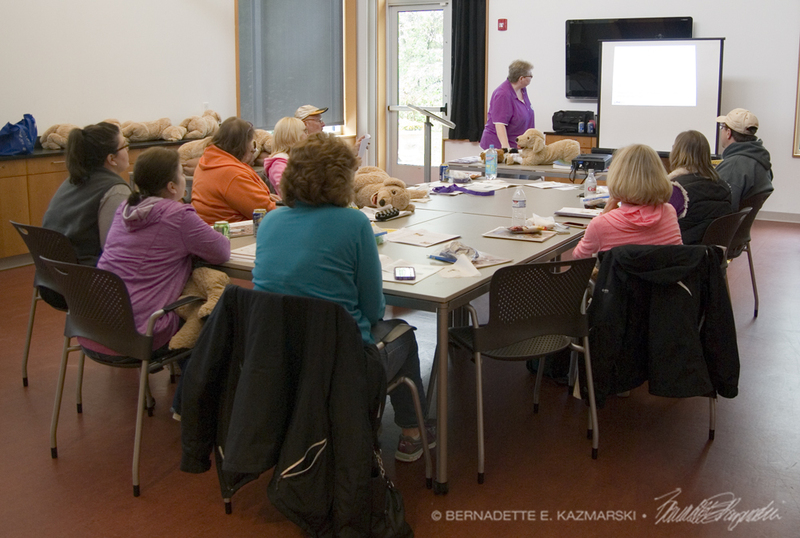 The two-hour class is designed as an introduction for pet owners. Attendees learn about some of the more common situations that might be encountered such as choking, a demonstration of CPR for cats and different breeds of dogs, heat stroke/heat stress/safety precautions about hot weather, plus disaster preparedness including what you need to have on hand in case of a disaster. With the number of weather related problems we have experienced during the past several years (floods, tornadoes and large snowfalls with power outages), the western Pennsylvania area has not been spared the impact these conditions can have on our beloved pets. All classes will help families be prepared for such emergencies. Deb Chebatoris has offered classes to help people keep their pets happy and healthy since 2011. Even though her business is aftercare for pets and their families, “I don’t want to see any pet until its time, until it has lived the longest and best life it could have,” Deb said. “If giving a pet owner the basics of pet first aid so that the skills help save the pet’s life in an emergency, that goal is met for me and I’m thrilled I could help the family and the pet continue living happily. “It is difficult when we lose a pet who has lived a full and long life,” Deb continued, but sometimes it’s curious little ones who get into an emergency situation. “It is practically impossible to say goodbye when the pet is young. The grief is palpable in these situations, with families saying they had such plans for the life cut drastically short,” says Deb. “When I need to work with a family whose young, healthy pet has succumbed to an accidental death, it is a double tragedy.” Not only does the family experience the loss but there is a lingering feeling that “if only…” they would have done this or that, the death may not have occurred. Because space is limited participants must register to attend by calling Deb at 412/220-7800 before Friday, March 31. Please check the Chartiers Custom Pet Cremation website www.ccpc.ws for details as other classes are scheduled. With the number of weather related problems we have experienced during the past several years (floods, tornadoes and large snowfalls with power outages), the western Pennsylvania area has not been spared the impact these conditions can have on our beloved pets. All classes will help families be prepared for such emergencies. Because space is limited participants must register to attend by calling Deb at 412/220-7800 before Monday, October 17. Please check the Chartiers Custom Pet Cremation website www.ccpc.ws for details as other classes are scheduled. As a disclosure, Deb Chebatoris and her business Chartiers Custom Pet Cremation are one of my customers, and I am one of hers. I wrote and distributed the press release, but even if this were not the case I’d encourage anyone with pets, and especially anyone who rescues or fosters or works with animals, to attend a pet first aid class and get their certification. It’s well worth the time and effort. I received my certification in Pet First Aid from Karen Sable at the first class Deb offered. I have never had to use any emergency treatments myself but I have passed the information along to others in emergencies, and the information about creating an emergency first aid kit and disaster preparation were very helpful in planning ahead should something happen when I have all these cats in the house.